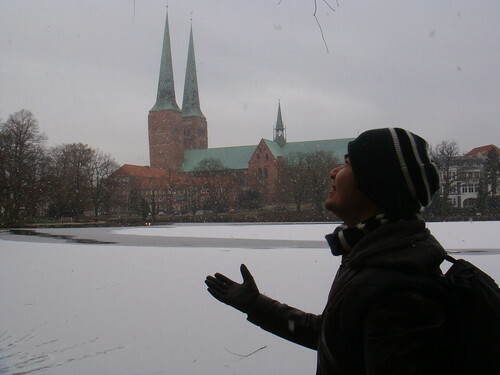 Kiel is the capital of Schlegswig-Holstein which is a sailing town on the Northern part of Germany. The city center harbour is the starting position for huge ferries to Norway and Sweden. It might be my next plan to try and take a ferry from here to Norway and Sweden. If you are travelling from Hamburg like I did, the journey will take you a little above 1 hour by train to the Kiel central station. There is a tourist center in the station where you get a free map to guide yourself. Alternatively, there is a larger tourist center in the new city hall which is reachable 10 mins by foot. If you like shopping, there is a long stretch of pedestrian street with a great variety of stores. We made our journey pass through the street to visit the old Rathaus (City Hall) which is near the Opera House. Just a stone throw away, you will come across Hiroshima Park and also a large lake, Kleine Kiel which gives you a magnificent view of the city. 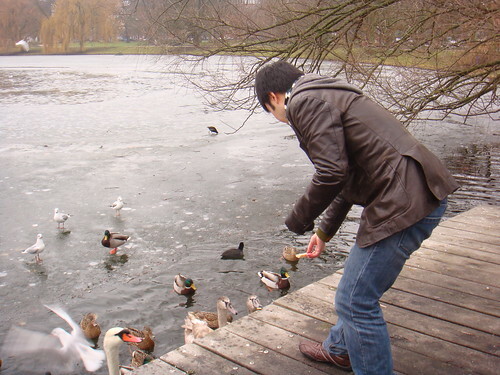 The lake is almost fully frozen and I took the opportunity to feed some of the birds with bread in a small water opening. 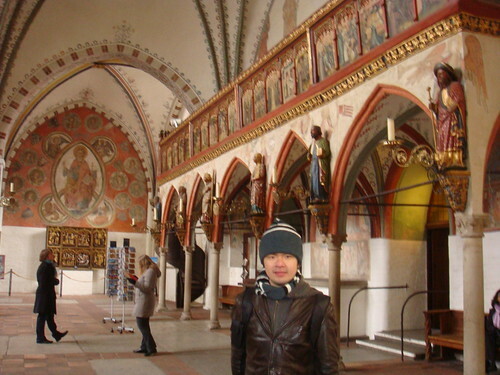 We continued on to visit the St Nikolai Church before settling down for a meal at Subways. 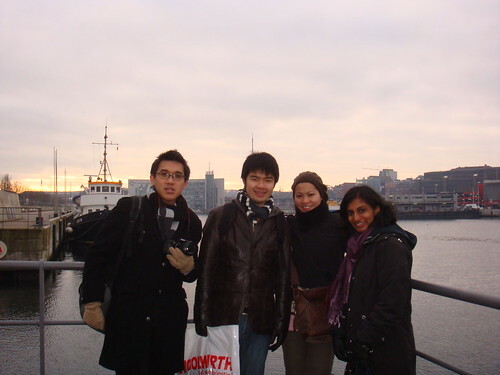 We then cross the Horn Bridge to the view the city from the other side of the harbour. We managed to spend half a day here before we decided that we have seen enough. 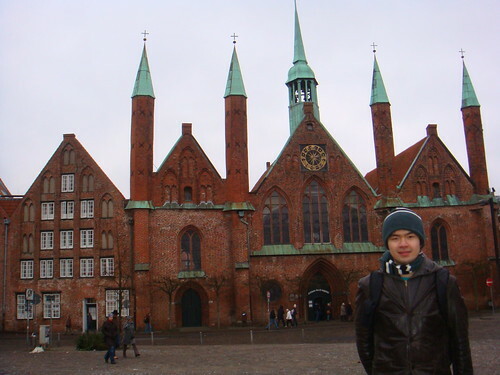 Kiel is a very small Sailing City which have a few historical sites and building. It is suitable for a visit to escape the crowds of bigger cities. I would most probably give this place a skip if I have limited time visiting Germany. That's all for now, till my next post, take care! Yeah, the first weekend day trip of 2009! 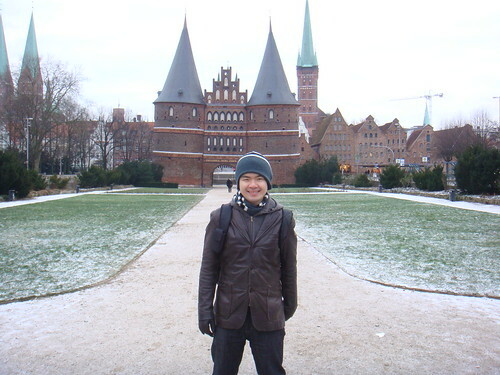 We decided to head to the nearby city of LÃƒÂ¼beck. It was listed as a Unesco World Heritage Site in 1987 and being there makes you realized why. The city is only 40 minutes by train from Hamburg Central Station and as its old city is fairly small, everything is reachable on foot. There is a group ticket for up to 5 on offer for weekend trip which made our journey costs 28 Euros. Less than 6 Euros each! What a bargain! As you arrived at the city. 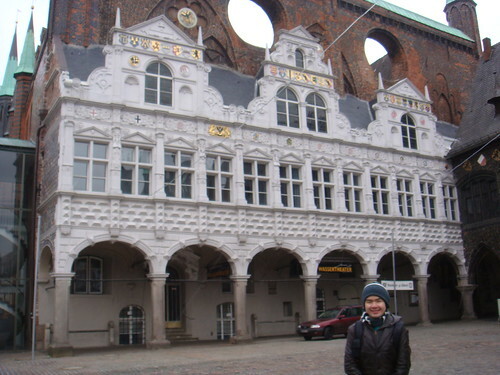 There is a tourist information center just adjacent the train station and another one near the grand Holstentor Gate which welcomes you to the city. As the city is pretty compact, it is hard to find space to capture the picture of the whole building. Maybe it is more doable using a much better camera. In the city center, there is a large open space where the city hall is along with what I believe is the Market Square. The journey here will take you through a huge variety of modern retailers which surprisingly blends in well with the city. 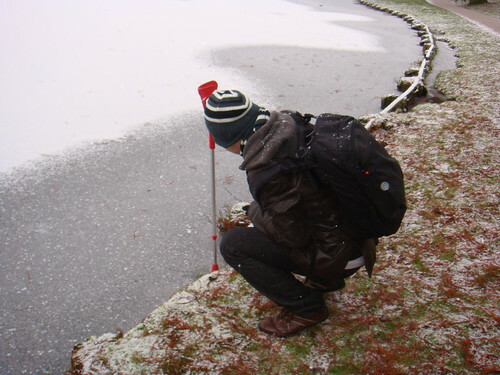 It snowed when we walking in the city and it was a nice sight to see a lake which is half frozen. Not convinced on whether it is rock solid, I decided to matters to hand by borrowing Song YiaÃ¢â‚¬â„¢s crutches (The news is out, she sprained her ankle) to break the surface. The city also boasts having the most Nobel Prize winners with 3 to its name. We visited BuddenbrookÃ¢â‚¬â„¢s house. I believed he won a prize for literature and his life is now a major local movie. 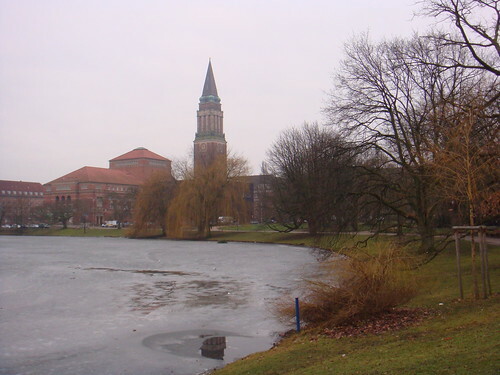 LÃƒÂ¼beckÃ¢â‚¬â„¢s wealthy citizens raised funds to build the "Hospital of the Holy Spirit". It is the first social welfare facility in Germany. Sick, Poor and Homeless people were accepted here. 170 beds were simply laid out on the floor then in the 19th Century dividing walls were built. Each room was equipped with the basics for everyday life. The hospital was built by the citizens for the citizens. We ended the day at the famous Niederegger cafe for everything made out of Marzipan. I had a Marzipan shake while pinching a variety of Marzipan flavoured cakes. ThatÃ¢â‚¬â„¢s all for now and I might try and squeeze in another day trip before I head home for Chinese New Year 2009! CanÃ¢â‚¬â„¢t wait! I welcomed 2009 with style the German way. 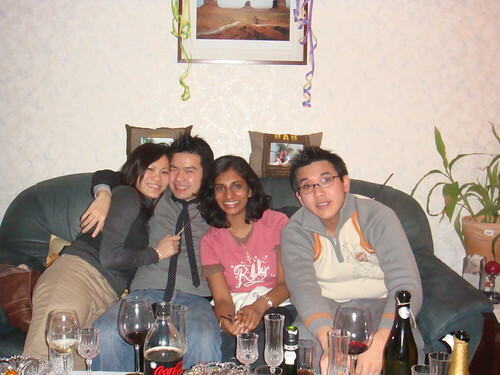 As it is my first New Year in Hamburg, I was invited by a local colleague along with other Malaysian expatriates to his house party. It was at Farmsen which I believe is one of the suburbs of Hamburg. We started quite early with the casual drinks before trying all sorts of fluids from the great variety of wines, champagnes and a shot of egg nog liquor. We were entertained by recorded live performances on national television before watching Mamma Mia! on blue ray high definition. We selected the sing a long version which shows you the lyrics as the subtitles like in the karaoke bars. We soon filled our hungry stomachs with food and loads of them. Generous portions of potato salad (one with turkey ham and the other with herring), sausages, ribs, chicken wings and the dish that won our hearts, fried glass noodle with prawns. As I have not been home since July last year, it certainly reminded me of home. We carried on with more singing and eating before we started our journey to the harbour for the grand finale countdown. As we left fairly late and could not squeeze into some of the trains, we arrived at the nick of time at Baumwall which was the closest station that is open. We were welcomed by the scent of burning fireworks and also the most amazing display of fireworks that lit up the whole city. Everyone was on a fireworks frenzy. Here is a very poorly captured video but hopefully it gives you a feel on how it was like to be there. It is common for the locals to bring their own fireworks and lit it up around the city concurrently with the city councils own display. Try an imagine seeing fireworks on every angle. I do pity the dogs of creatures that have much sensitive hearing as it would have been torture. One may also argue the safety aspect of matters as there were a lot of party goers that were releasing flying rockets from their hands and due to the trajectory, it often flew too low and lands on the ground while it explodes. The fire brigade and police officers can be seen and they did not disrupt any of such partying but I guess they will act should anything that might disturb the peace appears. The fireworks carried on through the night as I could evidently hear when I was woken by a loud blast at around three in the morning. A slight peek to the street from my bedroom window revealed what a huge mess this partying has resulted in. Firework wrappers and debris everywhere. What an aftermath and good luck to the local council which is in charge of cleaning up. I have celebrated two new years in London and it certainly did not prepared me for the experience in Hamburg. The crowd was massive as usual but the fellow party goers carrying fireworks was something very new. I need some shut eye now and also some time to plan out 2009. ThatÃ¢â‚¬â„¢s all for now and HAPPY NEW YEAR!! !